MSG (Monosodium glutamate) is a flavor enhancer added to canned vegetables, Chinese foods, processed meats, and soups. It was discovered more than 100 years ago by a Japanese chemist named Kikunae Ikeda who derived it from seaweed and determined that it imparts a unique taste to food items. He names the flavor enhancer ‘Umami’, which is Japanese for ‘5th taste’. Why food companies add MSG to foods? MSG was first marketed by Ajinomoto in Japan. Over the years it gained rapid popularity all over the world. Food companies began to use MSG not only for its unique ‘savory’ flavor that changes your perception of taste, but also for its low sodium content. Glutamate is known to stimulate umami taste receptors in the tongue. Umami is a Japanese word that describes a different category of flavor apart from the four traditional ones - sweet, salty, sour and bitter. In nature, there are several foods that contain natural, free glutamate, the content of which increases as these foods ripen. Increased level of glutamate adds a more flavorful taste. Some foods like tomatoes, cheese, and mushrooms enhance the taste of food because they have high glutamate level. 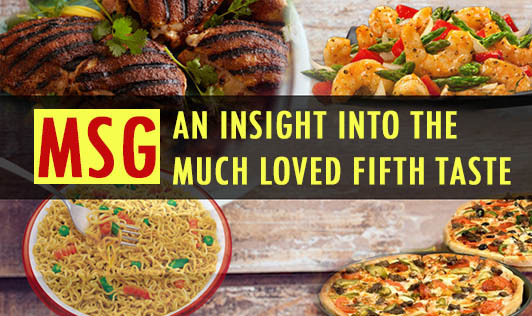 Considering the above facts, you may conclude that MSG is good for your taste buds. But, this is where it gets tricky. So before you make up your mind, you must read what the Food and Drug Administration (FDA) thinks about it. Is MSG really good for you? According to the FDA, the MSG-making process involves fermentation of starch, sugar beets, and sugarcane. The fermentation process increases glutamate levels and this may cause health issues, because excess glutamate is not good. Naturally occurring glutamate in food is not dangerous, but processed glutamate present in MSG is harmful. That is the reason MSG over-stimulates the nervous system. Every processed, fast food item involves the use of chemicals. Therefore, it is important to gain a sound understanding about the food items you are eating. Remember that not only is it important to eat healthy, it is important to stay well informed about what you’re eating as well.